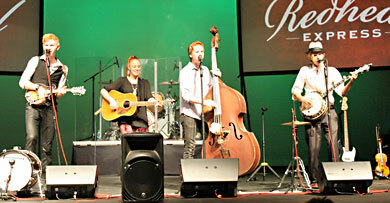 The Redhead Express together with their brothers, The Walker Boys, showcased their maturing musicality on the group’s return to Holstein’s Clausen Center last Saturday. It’s been six years since the seven siblings first appeared on this stage and subtle changes were discernible. Back then their show was a pleasant experience on the order of savoring home cranked vanilla ice cream – sweet and refreshing. But (Wow!) now it’s more like digging into a loaded banana split complete with extra toppings. It appears that, as the young people have grown up, they have started developing their own individual talents and styles. The family is no longer a homogeneous equation; rather it is becoming a heterogeneous combination of slightly disparate parts. Nowhere was this more apparent than in their eclectic playlist. Songs ranged from the strong performance of “Stand By Your Man”, an intense rendition on the bass of “Amazing Grace”, and a masterful finger picking demonstration of “Banjo Styles”. These were juxtaposed among such happy surprises as ” Lean On Me”, “Hallelujah”, and a wildly comic “Good Enough For Now”. All in all, it was a delightful turn of events. Conversely, there were some aspects of the act that haven’t changed and thank goodness for that. The family entourage still reveres its roots and steadfastly retains its respect for the armed forces. It may be safe to say that the most moving part of the evening was when they asked the vets in the audience to stand and then dedicated two songs to them. “I’m Proud To Be An American” and “God Bless The USA” were sung to show their gratitude to those who serve in defense of our nation. These contemporary paeons of praise are especially relevant during these days of divisive political rhetoric. We need to be reminded of how blessed we are to be living in this country. Special mention should also be made of The Redhead Express’s own compositions. “Roots”, “Ridin’ Bikes”, and “See What I See” spoke directly to the audience – some of whom did, indeed, “close their eyes and remember”. It was a grand show given by gracious folks. We were glad to have them back.